Newcastle now have 65 points from our 30 league games after a great defensive display allowed us to get a 1-0 hard-fought win at Molineux with the winner coming just before half time by Aleksandar Mitrovic. 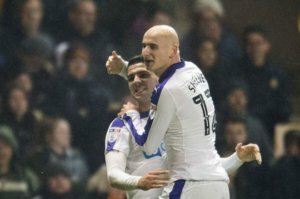 That was Mitro’s 6th goal of the season and we move on to 65 points from our 30 games – which is on track for 100 points over 46 games – and that would give us promotion. But we cannot take anything for granted in any game. Here’s the current state of the top six in the Championship after today’s games. And here’s an update list of our goalscorers – maybe Dwight Gayle will be back at Norwich on Tuesday night? Happy with the result. A nervy 2nd half. A big question for me though is have we lost all confidence in our back 4 and midfield to play the ball out from the back? I believe that Darlow was capable of playing the ball at least competently with is feet but now whenever the ball goes back to him at his feet, he tries to one time kick it on the roll, he never takes a touch for control anymore and then look for his outlet OR he just falls on it, gets up and punts it long. Rarely looks for a throw or roll out. We constantly gave the ball back to the other side. This has been going on for multiple games now. I don’t have a problem when clearing because you are under pressure but this is not a confidence building trait in the team at the moment and god awful to watch. You can see exactly the other team is going to win the ball from the hit and hope. But as I said happy with the result and we had a our good moments too. Just frustrated by this lack of confidence and footballing at the back. Great result to a frustrating performance. Too many easy giveaways, Colback? Seriously, he has to on borrowed time with this display. As for the Mitro goal, I’d like to think the ref was playing advantage, as there was a blatant handball from Wolves defender from Diame’s shot on goal which led to the goal. Ref again seemed to be against any 50/50 going Toon’s way. Clear penalty early on I think against Diame, still, take the result. Onwards and upwards! NOTE: At the half way point after 23 games NUFC’s form adjusted extrapolated points were 97, so still there or thereabouts..
BHAFC’s form has tailed off since the half way point (which fell after an exceptional run suggested they could break the 100 point mark), but after a winter blip Hoots is still on target for the top two. The real from team at present is HTFC, and any slips from the top 2 and they look set to take over. While NCFC’s form over the last 10 games is not earth shattering (at 1.7 pts per game) over the last 5 games this has shot up to 2.6 pts per game, ahead of even HTFC, which suggests a late surge could push them over 80 pts to grab a play off place should either SWFC or LUFC slip up. Good enough yesterday but lets face it, there’s a helluva overhaul needed if we get promoted. The gap to the Prem is widening every year. I’m certain Rafa is well aware of it. I hope Ashley knows it too.